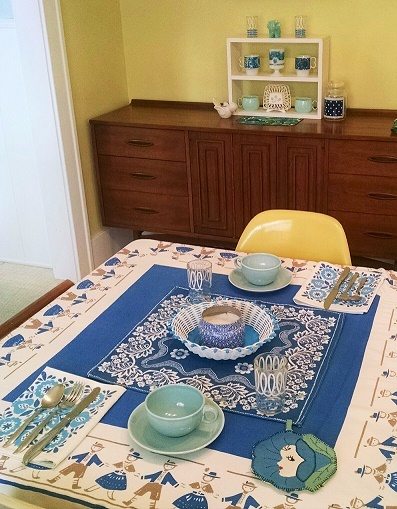 Color of the Month May 2016! Hey MAY! Wow! I’d say I’ve had a pretty stellar start to this year so I’m going with COOL blue this month. Feeling a little bit behind here with all the busyness and travel as of late, but oh well, loving it! I’ll be doing a post soon on my trip to Nashville to the Country Living Fair which was at the end of April in case you missed my social media posts. Be sure to follow along if you aren’t already, links at the bottom of the page. I’m keeping it short here as I try to play catch up with work and general life responsibilities, enjoy the May color of the month! Also garden season is here! Prepped my veggie gardens last night! YAY! Fave vintage items: awesome juice glasses-love these! 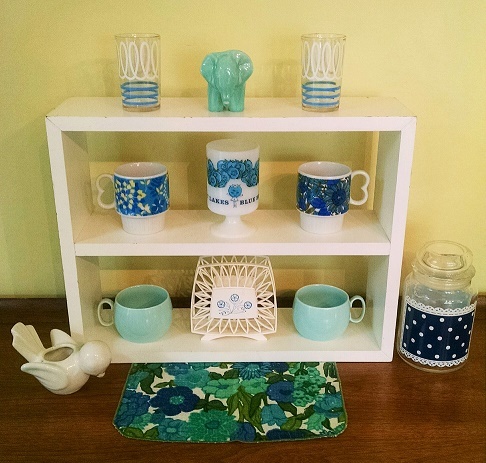 Vintage great lakes blueberry mug, cute little ceramic elephant, flower mugs, blue ceramic mugs, cornflower napkin holder, birdie planter, floral napkin, and polka dot glass canister. 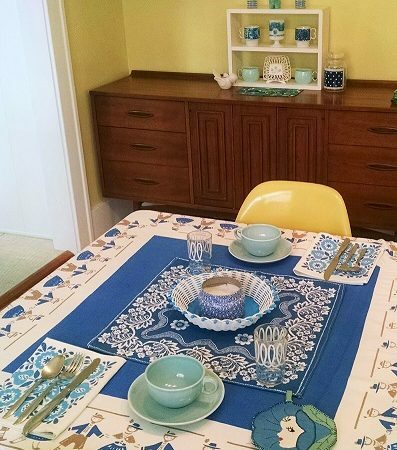 Fave vintage: tablecloth, funny flower lady potholder, patterned napkins, ceramic cup n saucers, juice glasses, woven plastic basket, and napkin as a centerpiece.